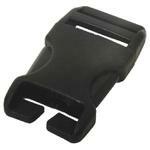 1" side release buckles are slotted to slip into webbing loops in a hurry. Replace a broken buckle in a minute without sewing. Also useful as a way to attach additonal pockets or pouches onto backpacks. Package of 2.